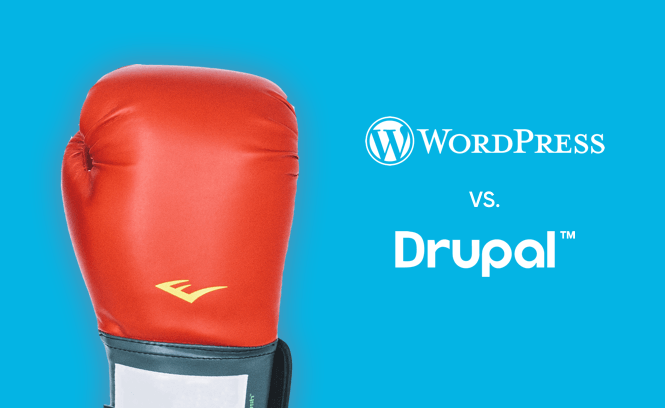 WordPress vs Drupal: which CMS should I choose? Chances are, if you’re on this page, you’re familiar with the basics of what goes into a website project. You will probably know that a Content Management System (CMS) holds your content in the back-end and renders it into a useful site on the front-end. Taking this guessing game a step further, you could well be somebody who is looking to oversee a new website project, and after a bit of research have decided you agree with the principles of open-source technology. In fact is one of the first major decisions you will have to make in a long sequence of major decisions. The sea of different CMS solutions out there, some premium/licensed, some open source, can all seem like much of a muchness as you evaluate your own business needs. Ultimately, on your travels two of the CMS platforms, you will likely hear about are Drupal and WordPress. Why though, do people in the know often compare these two platforms? Aside from being two of the most widely used CMS’ on the planet, both are excellent examples of open source software, which is when original source code is made freely available and may be modified or redistributed. This cuts costs significantly in comparison to a proprietary CMS and may explain why when looking at WordPress vs Drupal, they cover over a third of the CMS that power the internet. Being open-source also means that there is a large community of users and contributors, mainly volunteers, that help maintain and enhance the software for the better of those using it. Pretty cool, right? There are quite a few similarities when looking at WordPress Vs Drupal but what are the mitigating factors that help you decide which one to choose? We’ve decided to analyse what we believe are the key metrics for a high-functioning website. Whilst having previously extolled the virtues of open source software, one of which is that the core underlying CMS software is free, we have to add the caveat that of course designing and building a strategic website comes with a cost. There will be a certain amount of designing and developing needed with both CMS depending on the required specifications, not to mention hosting costs that will vary depending on the scale and pressure of the environment you’re delivering your site into. Both CMS are built using similar technologies, mainly PHP & MySQL. In terms of overall development costs for any given project, both Drupal and WordPress have very similar out of the box functionality when compared side by side. Overall however, it is likely that development team costs are often seen to be a bit higher for Drupal when compared to WordPress, as the time needed to carry out bespoke Drupal development is often greater. Otherwise, the other elements that make up a typical bespoke website design and build project (such as discovery, UX, design, project management etc) should be largely similar regardless of whether you are choosing Drupal or WordPress. Verdict – WordPress 1, Drupal 0. Both WordPress and Drupal have an extensive range of plugins and modules that can extend functionality easily. However, with WordPress having the larger CMS market share and largest development community, there is a wider ecosystem of plugins and extensions to work with, which could, in turn, save some development costs down the line. Plugins are great and a big part of the reason WordPress has been so successful, but should not be overused so as to keep your site running as smoothly, safely and speedily as possible. However, there are some great plugins that are widely used and well supported, such as Gravity Forms to power forms or Yoast to help improve SEO, which come up on lots of our projects. The new Gutenberg WordPress editor has also now been released, pushing the editing experience for users of WordPress forwards dramatically. In terms of flexibility, both CMS gives users the chance to easily and flexibly manage content. Drupal used to be able to manage more content, but now WordPress has evolved to become an enterprise-grade publishing platform, used by high traffic publishers serving up millions of page views per day. Verdict – A point apiece – WordPress 3, Drupal 2. This is one of the major battlegrounds of WordPress Vs Drupal, as this is where there is a stark contrast between the two platforms, and it’s why it’s so important to have a proper audit of your site, and a discovery phase to fully understand the future user needs of anyone you plan on accessing the site. Once your user needs have been established, it’s time to figure out which CMS would suit you more, and when it comes to simplicity of set-up, there’s one clear winner in this round. WordPress is widely recognised as one of the easiest to use CMS systems out there. Lots of marketers and content managers have spent many years working with WordPress, and intend to continue using it as much as they can because it empowers them to do what they need on a day to day basis. With WordPress, tools like the WYSIWYG editor and the new Gutenberg editor only make it even easier for users to create meaningful and unique content. Verdict – WordPress wins this round convincingly, WordPress 4, Drupal 2. This is, one, some would say, the one area that Drupal might have traditionally had the edge, with WordPress having formerly run into the odd security incident. But when WordPress powers over 33.0% of all websites (as of January 2019), it is no surprise that every now and then someone might leave a WordPress install unloved and out of date, and therefore open to some vulnerability. However, any open source CMS, by virtue of how it is built and the fact that it is contributed to by many developers with lots of possible plugins and extensions, could be open to security vulnerabilities, whether it is WordPress or Drupal. Over time WordPress has evolved and become capable of being a truly enterprise CMS when delivered in the right way, with best practices followed, a deep knowledge of WordPress development and the right investment in hosting infrastructure. All in all, it should be a fair fight these days on the security front, but on the basis that the project is approached in the right way. Verdict – A hard-earned point apiece. WordPress 5, Drupal 3. So there we have it, no technical knockouts but a winner on points. The previous train of thought on WordPress inadequacies have over time been proven to be archaic and from a time when WordPress was ‘just a blogging service’. The sheer size and dedication of the network of WordPress users around the globe has enabled it to catch up with Drupal in some instances and even overtaken it on others. It was always ahead of Drupal on cost and ease of use, however, the work done by WordPress to improve it’s security procedures has elevated it ahead of Drupal as an overall choice.